Populus grandidentata.Copyright.©.2014.Donald Cameron.New England Wild Flower Society.gobotany.newenglandwild.org. (Both Accessed 9/2014). Populus grandidentata is a tree to 24 m tall; 60 cm dbh; short-lived, fast-growing, colonial from shallow lateral roots, especially if disturbed; roots associated with ectomycorrhizae (Basidiomycotina, including: Boletus piperatus, pepper bolete; Cantharellus cibarius, chanterelle; Suillus granulatus, granulated bolete; and Hygrophorus unguinosus), (Nantel and Neumann 1992); young bark smooth yellow-green, becoming brown, furrowed in age; terminal buds dull, hairy; growth pattern indeterminate (Gargiullo personal observation). Leaves alternate, 5-12 cm long, 2-7 cm wide, egg-shaped with large, distant marginal teeth (5-15 per side), tip pointed, base wedge-shaped to rounded, dark green above, young leaves hairy below, becoming smooth, pale-waxy below, with 2-3 basal glands at top of leaf stalk (Petrides1988), leaf stalks flat. 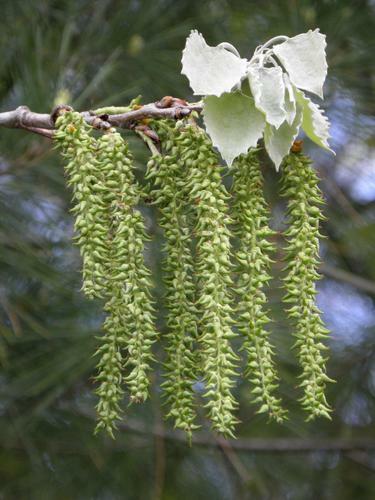 Flowers sexes on separate individuals, tiny, in tan catkins about 6 cm long, wind pollinated, male and female flowers on separate trees (dioecious), males and females bloom about same time. Populus grandidentata.bark.© Copyright Steve Baskauf, 2002-2011.www.discoverlife.org. (Accessed 9/2014). Fruits small capsules. Seeds tiny, wind dispersed by silky, white hairs, before leafing out, April-May. Buds and catkins eaten by birds and mammals. (Martin et al., 1951). Seeds viable for 2-3 weeks only, needs bare moist soil. Habitat: Well drained, open areas, fill, landfills, burns and bare, low nutrient soil, pH 4.8-7.2 (USDA, NRCS 2010); moderately tolerant of salt, drought. Intolerant of flooding, soil compaction. Very intolerant of shade, index 1 (Hightshoe 1988). 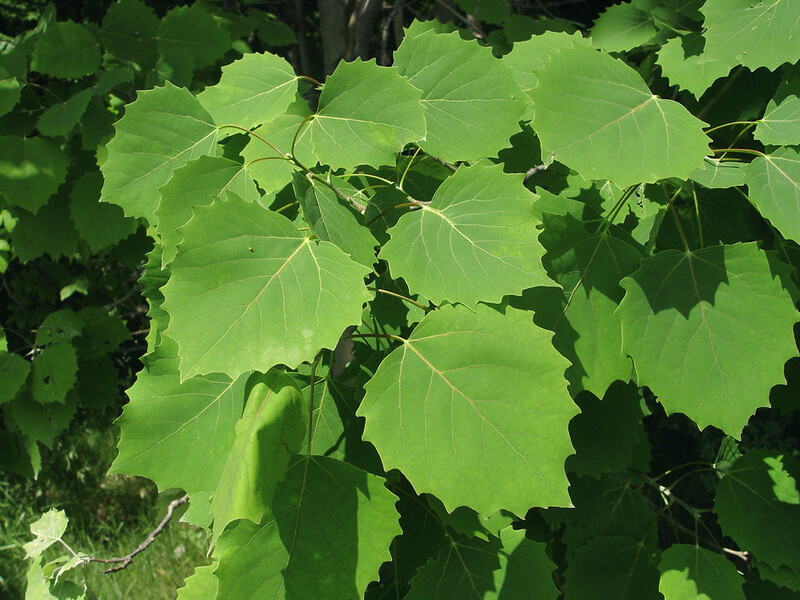 Populus grandidentata. female inflorescences.nhmountainhiking.com (Accessed 2/2017). Notes: Pioneer species. Twigs and bark and foliage eaten by deer and rabbits (Martin et al. 1951). Produces open, dappled shade. Clonal connection persistent between trunks until one dies. Very susceptible to fire, but regenerates rapidly from root sprouting. A host tree of the Asian longhorn beetle, Anoplophora glabripennis (see Norway maple). 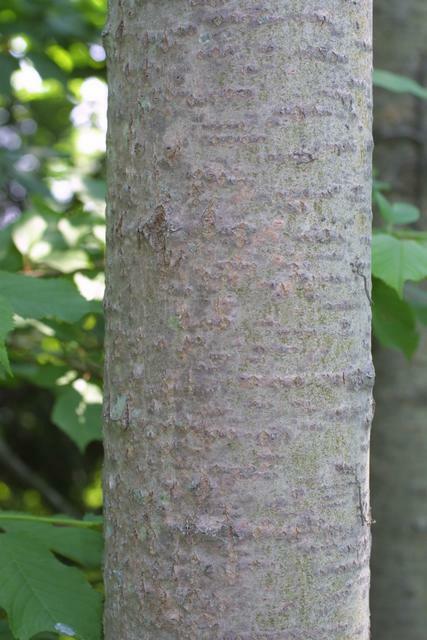 Attacked by poplar borer, Saperda calcarata, (see P. deltoides) that leaves trees open to fungal infections such as the Hypoxylon canker of aspens (Hypoxylon mammatum). Big tooth aspen may also be infected by Cryptosphaeria populina a canker of aspens that appear as elongate dark areas of dead bark. The fungus usually infects wounds in bark and may kill enough sapwood to be fatal (Burns and Honkala 1990; Sinclair et al. 1987).